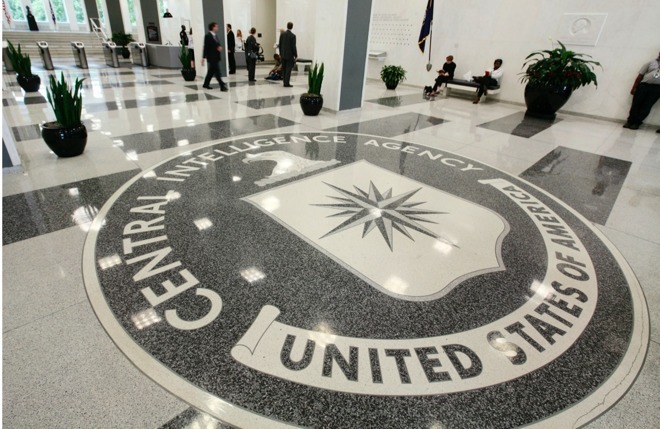 The CIA has issued a statement criticizing the massive WikiLeaks reveal of its iPhone, macOS, Android, and Windows hacking department, amidst international outcry about the leak —and tens of thousands more documents are allegedly on the way. In a statement provided to AppleInsider and other news venues, the CIA refuses to comment on the authenticity of the WikiLeaks data dump, or "the status of any investigation into the source of the documents." However, despite not making a comment, the agency continues with three talking points. The CIA notes that it's purview remains to be "the first line of defense in protecting this country from enemies abroad" and notes that "America deserves nothing less." Citing legal prohibitions, the agency also reiterates that it is prohibited from conducting electronic surveillance in the U.S.
"The American public should be deeply trouble by any WikiLeaks disclosure designed to damage the Intelligence Community's ability to protect America against terrorists and other adversaries," the CIA emphasizes in its third point. "Such disclosures not only jeopardize U.S. personnel and operations, but also equip our adversaries with tools and information to do us harm." While the CIA won't comment on the status of the investigation, according to a report from ABC citing sources familiar with the matter, the FBI is examining the potential sources and the methods of the leaks. AppleInsider can confirm based on discussions with people familiar with the matter that the Department of Homeland Security is getting involved in the investigation as well. In China, the Chinese Foreign Ministry is urging the US to stop "stop listening in, monitoring, stealing secrets and internet hacking" against the country. China has a deep in-country internet monitoring system, as well as the so-called "Great Firewall of China." The German government is examining the first batch of data as well. In a statement, the German Foreign Ministry states that it is attempting to authenticate the documents. "We will initiate an investigation if we see evidence of concrete criminal acts or specific perpetrators," said the German consulate's office. "We're looking at it very carefully." Previously, documents were released by WikiLeaks showing that the NSA had intercepted communications by German Chancellor Angela Merkel. WikiLeaks promises that the "Vault 7" release from Tuesday is only the beginning of the disclosures. 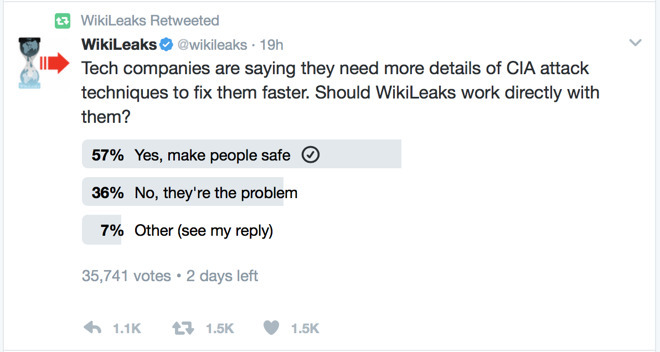 A non-scientific poll conducted by WikiLeaks on Twitter shows 57 percent of its followers want the group to coordinate with technology companies, including Apple, to fix attack vectors faster. About 36 percent say that the tech companies are the problem, with 7 percent having a more nuanced view of the issue, roughly balanced between controlled disclosures to tech companies and calls from voters seeking WikiLeaks itself to be shut down. On Tuesday, 8,761 files were released by WikiLeaks alleging that the U.S. Central Intelligence Agency has a dedicated iOS, Windows, and Android exploit team, and failed to keep the attack vectors under lock and key. Later on Tuesday, Apple noted that "many" of the attacks had already been dealt with in the course of updating iOS. A closer look at the Apple exploits showed a great deal of effort put into attacking Apple gear, but found what has been disclosed so far to be rudimentary, non-functional, or proof-of-concept only.